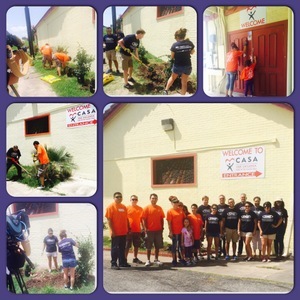 (Corpus Christi, TX – July 13, 2015) On Friday, July 10, SMG managed American Bank Center staff along with employees of Home Depot all met up at the CASA of the Coastal Bend to lend a helping hand to the facility. Court Appointed Special Advocates™ (CASA) provides the court system with detailed information needed to safeguard the children’s best interests and ensure that they are placed in safe, permanent homes as quickly as possible. This program is so successful, that it has been copied around the nation. Founded in 1977, SMG provides management services to more than 230 public assembly facilities including convention and exhibition centers, arenas, stadiums, theaters, performing arts centers, equestrian facilities, science centers and a variety of other venues. With facilities across the globe, SMG manages more than 15 million square feet of exhibition space and more than 1.5 million sports and entertainment seats. As the recognized global industry leader, SMG provides venue management, sales, marketing, event booking and programming, construction and design consulting, and pre-opening services for such landmark facilities as McCormick Place & Solider Field in Chicago, Moscone Convention Center in San Francisco, Houston’s NRG Park and the Mercedes-Benz Superdome in New Orleans. SMG also offers food and beverage operations through its concessions and catering company SAVOR, currently serving more than 130 accounts worldwide. SMG managed American Bank Center is Corpus Christi’s premier event center. Follow us online at www.Americanbankcenter.com, facebook.com/AmericanBankCenter, twitter.com/AmericanBankCtr, on Instagram @americanbankcenter, and Tumblr @AmericanBankCenter.